The Cruise Web’s newest infographic reveals the elegant ms Nieuw Statendam, the next incredible cruise ship from Holland America Line. Holland America Line’s next cruise ship, ms Nieuw Statendam, is preparing for her debut in December 2018. The 2,660-passenger Nieuw Statendam will be a sister ship to ms Koningsdam and will be the second ship in the Pinnacle class. She will continue Holland America Line’s tradition of classic style and service with 21st-century sophistication. 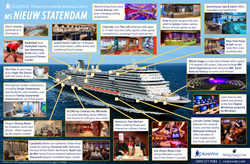 While waiting for her debut, cruisers can enjoy a sneak peek of Nieuw Statendam with a new infographic from The Cruise Web. Cruisers aboard Holland America’s ships are guaranteed to be surrounded by the most elegant spaces, dine on delicious cuisine, enjoy high quality entertainment, relax in spacious and comfortable accommodations, and have the trip of a lifetime. Nieuw Statendam will proudly carry on this tradition when she debuts in late 2018, appealing to cruisers seeking excitement, relaxation, or a mix of both. As cruisers sail to their dream destinations aboard Nieuw Statendam, she will provide plenty of entertainment for those sea days and evenings! Perhaps cruisers will enjoy a night of listening to the best of Memphis-style music performed by the B.B. King’s All-Stars Band in the B.B. King’s Blues Club. Another option is the dazzling World Stage, with its two-story wraparound LED screen that will entice all the senses of its audience. Perhaps a movie out on the Lido Deck with complimentary popcorn is the perfect way to relax. Or, maybe the fun blend of music, karaoke, and trivia at Billboard Onboard will be the perfect evening. Speaking of blending, BLEND by Chateau Ste. Michelle gives guests the chance to blend their own custom wines! Of course, before heading out to those fun activities, cruisers will probably want to grab something to eat. Thankfully, Nieuw Statendam has plenty of enticing restaurants featuring various culinary styles, from Asian to the Pacific Northwest, Italian to French. The Dining Room is an elegant included restaurant that serves everything from breakfast to an amazing 5-course dinner, including dishes inspired by the various regions. The Grand Dutch Café is dedicated to Holland America Line’s Dutch roots and is where cruisers can enjoy traditional Dutch food and drink. Those looking for a French-inspired meal should go to Sel de Mer, which offers a delicious twist on classic French seafood dishes. No matter the craving, Nieuw Statendam will have something to satisfy it. After all the delicious food and outstanding entertainment, cruisers will be able to return to their comfortable, contemporary elegant accommodations. Nieuw Statendam has accommodations perfect for all types of cruisers, from the suites to the verandahs to the interiors. All cabins include modern touches like bedside USB ports and frameless shower doors. No matter what accommodations guests select, they are guaranteed to enjoy a comfortable and relaxing trip. Nieuw Statendam will make her debut voyage in December 2018 with a transatlantic sailing from Civitavecchia (Rome) to Ft. Lauderdale. After she completes her 14-day premiere voyage, Nieuw Statendam will spend the rest of the winter season sailing roundtrip from Ft. Lauderdale to the Caribbean. To learn more about Nieuw Statendam, and how you can be a part of her historic debut sailings, call The Cruise Web’s expert cruise consultants today at 1-800-377-9383. The Cruise Web is a travel agency with more than 20 years of expertise in matching travelers with their perfect cruise vacation. Using a fun, personal and complimentary consultative process, The Cruise Web takes the stress out of vacation planning. The Cruise Web’s clients come from around the world to find the best value for their time and money. Contact The Cruise Web today at 1-800-377-9383 (toll-free) or 001-240-487-0155 (international), and visit The Cruise Web online at CruiseWeb.com for the best cruise specials.